We wanted to give you a quick update on things to come in the following weeks. There’s been a ton of changes in the past month already, but in August we will focus on what we feel are amongst the most pressing problems and overdue improvements to improve the gameplay and your experience! – In-country rankings, so you’ll be able to check where your fellow (and opposing) countrymen rank. Sometimes internal competition is even fiercer than external! – investigation of ocassional country chat issues, messages sometimes disappearing etc. Some players already collected all 10 investors, and that’s arisen curiosity amongst other special investors who can provide you with additional boosts. Meet 2 of them! Can you find yourself in the TOP rankings? Congratulations to all winners of the 1st Competition Round! Browser game with 50.000 players! It’s been a long way to reach this huge milestone. We’ve been dealing with various design improvements, bug fixing, planning future updates, analyzing statistics,… We are thrilled that you are supporting us and we would like to thank every single soldier playing the game and participating in our community. You can find us on Facebook, Twitter, Reddit – join us on channels you are using to get latest news about the game! 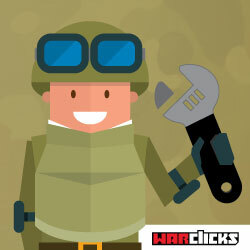 We are happy to announce that our latest major update on WarClicks is NOW LIVE – Weekly Competitions! It’s been a while since we posted major update, as we were working on one that we are almost finished with – Competitions are coming to WarClicks, where you will not be able to fight for various rankings on a weekly basis. Top players (both new and old) will be able to compete every week for special badges that will not only look cool in your profile, but also give you some special boosts for your WarZone and BootCamp. This update is not meant only as a reward for your constant efforts, but also to give everyone something additional to aim for every week! It’s coming soon, so you better start preparing your strategy of how you’ll beat your opponents and become the better player. As you’ve noticed we are changing and improving the game constantly and this will be one of the first updates to make it more interesting, competitive and rewarding to play for everyone! Check out our the first leak of graphics(rewards) for the upcoming COMPETITIONS! Active players will be rewarded for their activities and positions in the weekly competitions. Higher rankings = higher rewards.